A very brave, very blue bear named Grizz decided he'd had enough of Robin Lopez's serial NBA mascot abuse, and he fought back the best way he knew how on March 21. The Memphis Grizzlies' plush avatar didn't maul Lopez, nor did he bash the Portland Trail Blazers center with polyester paws. He feigned a peace treaty and planted a kick-me sign on Lopez's back. Mascots everywhere rejoiced—silently, of course—as they had a new champion, a stalwart soul willing to stand up against a true scourge of the mascot's way of life. There will be retribution, though, and it will be swift and thorough. Lopez has never needed much provocation. Lopez's first documented incident involved Hooper, the Detroit Pistons' mascot. On Dec. 15, 2013, Detroit's equine representative donned a wig to poke fun at Lopez's unruly locks. It was a bold play by Hooper, especially because just days earlier, Robin's brother, Brook, led an attack that resulted in Hooper being dragged off the court. Robin was quick to take up the challenge, and the above-posted wig-snatching and beatdown were the results. 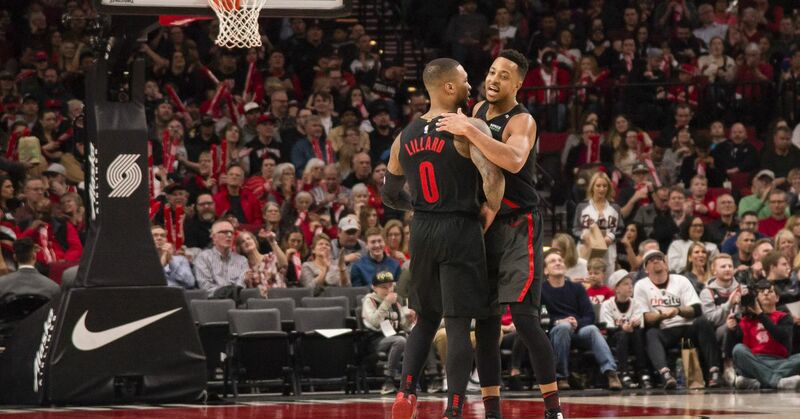 "Of course I had to stick up for the family name," said Robin, via Casey Holdahl of Blazers.com. "He really should have thought twice before stepping to me. …He was really throwing rocks at the hornet's nest." Perhaps enjoying the taste of power—or maybe living out a lifelong dream of putting mascots in their place—Lopez never looked back. His appetite had been whetted. From then on, every NBA mascot was on notice: When Lopez came to town, things were going to get physical. It would take nearly a year until Lopez's crime spree got its start in earnest, and he kicked it off, appropriately, with Hooper. Soon afterward, the San Antonio Spurs' Coyote went down. He never saw it coming. "I expect the mascot union to issue a statement demanding Lopez's banishment from the league in the near future," wrote SB Nation's Seth Rosenthal. No offense @rolopez42, but I only feud with the more high profile of twin brothers. No one remembers the mascot fights with Ed Mikan. Stinging from Moondog's solid burn, Lopez's reign of terror accelerated. When Harry the Hawk called him out this past January, we should have known what was coming. As part of a longstanding tradition for mitigating mascot disputes, Lopez and Harry engaged in a staredown. And when Lopez lost (possibly because Harry's eyes aren't actually capable of blinking), he resorted to the same violent pattern he'd established over the preceding year. March has been a most violent month, and it has taught us something important: When Lopez hits the road, he packs a grudge. Portland's five-game trip began March 15 in Toronto. It was mascot night, because of course it was, and Lopez wasted no time. In Washington on March 16, G-Wiz was next. Lopez snatched his hat and later knocked him out cold. Moondog, long among the most defiant forces against Lopez's reign of terror, called in Brook for a photo that doubled as the ultimate act of betrayal. Considering Brook was the one who started everything by taking out Hooper in 2013, his complicity in zinging his brother had to hurt. As you might imagine, Lopez continued bashing mascots with renewed zeal. Stuff, the Orlando Magic's otherwise harmless representative, got it next. Which brings us back to where we started, with Grizz luring Lopez into an embrace on Monday that will surely keep feud fires fueled. This is a war with no end in sight.